First Circuit Upholds "Don"t Ask, Don't Tell"
The First Circuit released its decision in Pietrangelo v. Gates yesterday, upholding the military's "don't ask, don't tell" policy against a due process, equal protection and First Amendment challenge. The Second, Fourth, Eighth and Ninth circuits had previously upheld the policy, but Pietrangelo is only the second circuit to do so after the Supreme Court's 2003 decision in Lawrence v. Texas and the California Supreme Court's In re Marriage Cases. I'd personally rather see the President scrap the policy than rely on the courts, but whether that happens remains to be seen. McCain's out (last year he called gay troops "an intolerable risk" to national security). But Obama acknowledged in an interview last April that the policy was a "counterproductive strategy" that sacrificed highly qualified service members with necessary skills - the ability to translate Arabic, for instance. But he made no promises, saying only that we might "reasonably see" the policy repealed under his administration. At bottom, of course, the policy is more than counterproductive, its absurdly homophobic. Consider the provision that gave rise to the Plaintiffs' First Amendment challenge in Pietrangelo. It subjects to dismissal any service member who "state[s] that he or she is a homosexual or words to that effect." Making that statement creates a "rebuttable presumption" that the service member "engages in, attempts to engage in, intends to engage in, or has a propensity to engage in a homosexual act." The court rejected the challenge on an understanding that "the Act's purpose is not to restrict military members from expressing their sexual orientation. Its purpose is to identify those who have engaged in or are likely to engage in a homosexual act." But herein lies the problem. The policy overstates the impulse of sexuality by conflating identity with behavior. Think of it this way. What comes to mind when someone says "I'm not gay"? Not much I suspect in some contexts. Without more, we'd never accuse a self-proclaimed heterosexual of wanting to "engage in," "attempt to engage in," or having a "propensity to engage in" sexual activity that interferes with military performance. So why don't homosexual service members enjoy the same benefit of the doubt? Do we really still believe they're more likely than heterosexual soldiers to break the rules? To engage in sexual misconduct? To hit on a bunk mate? Its no secret that the military can be unwelcoming to gay and lesbian service members. Case in point: back in April, Joint Chiefs Chairman General Peter Pace declared that homosexuality is "immoral." But I like to think the majority of us - and them - are actually more evolved than that; that most soldiers have more to think about than where a fellow service member's orientation lies, that most reject the condescending definition of troop "cohesion" that provided the original justification for "don't ask, don't tell," and favor equality over exclusion, dignity over disparagement, and rights over restrictions in the name of protecting national security. Besides, they say that's what the troops are fighting for anyway, right? Cases like Pietrangelo haven't nudged the military in that direction. But the silver lining may be that they've left room for the next President to reverse course. Let's hope he's up to the challenge. I suppose some members of the International Olympic Committee hoped to focus world attention on human rights abuses in China when it awarded the 2008 games to Beijing. But two months shy of opening ceremonies there's not much reform to cheer about. Reporters Without Borders labels China "the worlds biggest prison for journalists and cyber-dissidents" and links to dispiriting headlines like Journalist gets four years for exposing Communist party corruption in Shandong and Tiananmen Square massacre still a taboo subject in press and online on 19th anniversary. Human Rights Watch reports that Rights Lawyers Face Disbarment Threats and 130 Tiananmen protesters remain behind bars. The Olympic Charter encourages "respect for human dignity" and "fundamental ethical principles." It describes "the practice of sport" as a "human right," and states that discrimination on the basis of "race, religion, politics, gender or otherwise is incompatible with belonging to the Olympic movement." But host countries themselves are not required to follow the rule of law or protect fundamental freedoms. Thus, Beijing 2008. With the prize already in hand, China has shown little willingness to play by the rules. But maybe the rules are part of the problem. In a press release on Friday Reporters Without Borders called on the IOC to make "respect for human rights and freedom of expression" part of the official citing criteria. No response yet from the IOC or whether the US, which itself has dropped the ball on human rights, would favor such a move. But its an overdue change - one that might have made a difference (however small) in China, and might encourage some concessions from the US ahead of Chicago's bid to host the 2016 games. Ahh, such fresh blogger enthusiasm! Rick Hills has burst onto the Prawfs scene, battling to defend Phyllis Schlafly, scorning Judith Butler, and now claiming the mantle of anti-intellectual. He has been scorched by Brian Leiter, Kevin Heller, and Patrick O'Donnell, among others. But today Tommy Crocker offers an extended comment to Hills' anti-intellectualism post that is both sharp and smart. Read it while it's hot! Update: As Kevin Heller points out in the comments (but I want to be obvious in the post) there is yet another smart and thorough retort to Rick Hills offered by Pam Karlan at Balkinization. 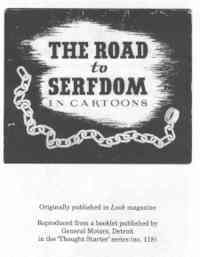 The Road to Serfdom in Cartoons? The illustration is from the Mises Institute's website. When Drexel was considering starting a law school, way back about an hour and a half ago, existing faculty and staff were committed to creating a college that avoided the traditional academic silos. People really wanted interaction between colleges and they imagined that law faculty and students would be popping up in interdisciplinary projects - research, teaching and service - constantly. Not surprisingly, this isn't a simple task - particularly when everyone at the law school is plenty busy with the day to day work of institution building. There are intellectual benefits, however, to getting out of the silo. The other day, during a job talk for an Honors College faculty slot, I learned that a 1950's Postmaster General, Arthur E. Summerfield, aggressively pursued a "missile mail" project. Figuring that rockets were particularly well suited to the delivery of mail, he conned the U.S. Navy into loading letters onto a Regulus cruise missile (with nuclear warhead removed) and shooting them off the USS Barbero submarine. They were aimed at a naval station in Florida and in due course - 22 minutes - two rockets filled with commemorative first-day covers arrived at the base. "This peacetime employment of a guided missile for the important and practical purpose of carrying mail, is the first known official use of missiles by any Post Office Department of any nation." Summerfield proclaimed the event to be "of historic significance to the peoples of the entire world," and predicted that "before man reaches the moon, mail will be delivered within hours from New York to California, to Britain, to India or Australia by guided missiles. We stand on the threshold of rocket mail." Maybe we can relax the next time a North Korea launches a Taepodong-2; they're probably just improving their mail delivery! Clint Eastwood's Dirty Harry: The Really Important Dialogue? I see from the LA Times that there's going to be a box set of Dirty Harry movies. Although the LA Times thinks it is somewhat surprising, Eastwood is re-embracing the movies. As the LA Times says, Harry's "darkly whispered one-liners (". . . You've got to ask yourself one question: 'Do I feel lucky?' Well, do ya, punk?" "Go ahead, make my day") were long ago drained of any real danger by stand-up comics, politicians and bumper stickers." Thus, it thinks that "It's easy to imagine Eastwood the auteur treating the character like a bad 1970s fashion choice." Not easy for me to imagine that. I think it's easier to imagine that Eastwood would reach back to those movies and legitimize them as art. 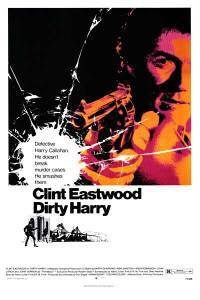 I remember the first time I saw my first Dirty Harry movie--it was just after I'd graduated from law school and I was filling in some of my cultural gaps. So about the same time I was reading Uncle Tom's Cabin, I was watching movies like Dirty Harry and Aliens. Of course the "make my day" line is classic--and had long since been a common piece of culture. But what struck me most about the movie at the time was not Eastwood's line, but ones from the San Francisco "establishment." After Harry gets a confession from a serial killer, he's called into his boss' office. There to greet him are the the district attorney and a judge who's also a Berkeley law professor! How's that for a combination of symbols of the left-wing establishment?! Instead of giving Harry an award, they yell at him. District Attorney: Where the hell does it say [in the Constitution] you've got a right to kick down doors, torture suspects, deny medical attention and legal counsel. Where have you been? Does Escobedo ring a bell? Miranda? I mean, you must have heard of the Fourth Amendment. What I'm saying is, that man had rights. Callahan: Well, I'm all "broken up" about that man's rights. District Attorney: It does not matter what Ballistics can do. This rifle might make a nice souvenir. But it's inadmissible as evidence. District Attorney: It's the law. Callahan: Well then, the law is crazy! District Attorney: This is Judge Bannerman of the appellate court. He also holds classes in constitutional law in Berkeley. I've asked him for an opinion, your Honor? Judge: Well, in my opinion, the search of the suspect's quarters was illegal. Evidence obtained thereby, such as that hunting rifle, for instance, is inadmissible in court. You should have gotten a search warrant. I'm sorry, but it's that simple.